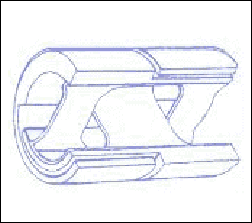 Flex bearings are constructed utilizing flat springs which are locked and crossed at a 90 degree angle and encapsulated in a cylindrical steel housing. A cutaway on the left shows the construction of the C-Flex bearing. Using them seemed like a good idea. When I had originally designed Q2, I made the decision to use a knife edge suspension. The pendulum in Q2 is a true compound pendulum and I wasn't at all sure that a knife edge suspension would be appropriate for this type of pendulum. The new Q2 cross spring suspension known as a C-Flex Bearing.